Easy Ham and Swiss Cheese Quiche is a basic, yet tasty quiche recipe perfect for brunch with only 5 ingredients and 5 minutes of prep work. 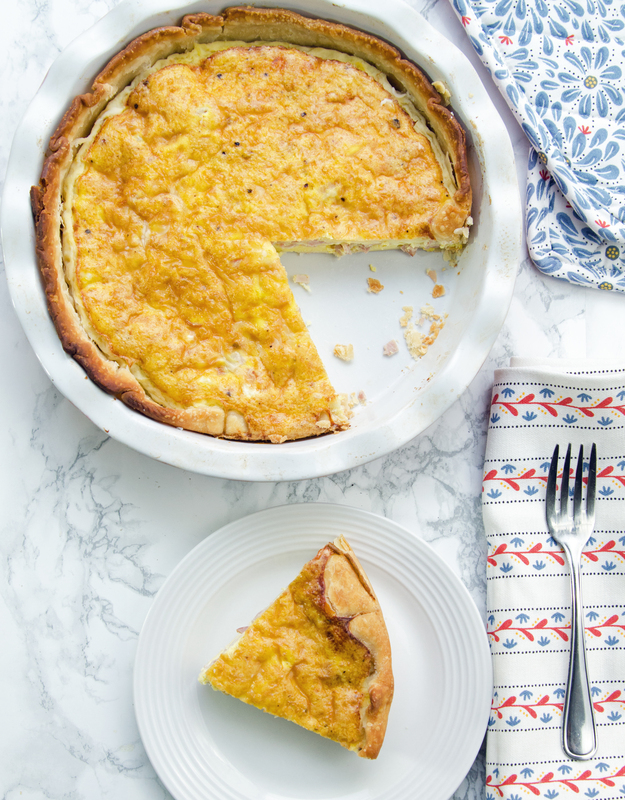 This Easy Ham and Swiss Quiche has long been a fixture on my brunch menus. 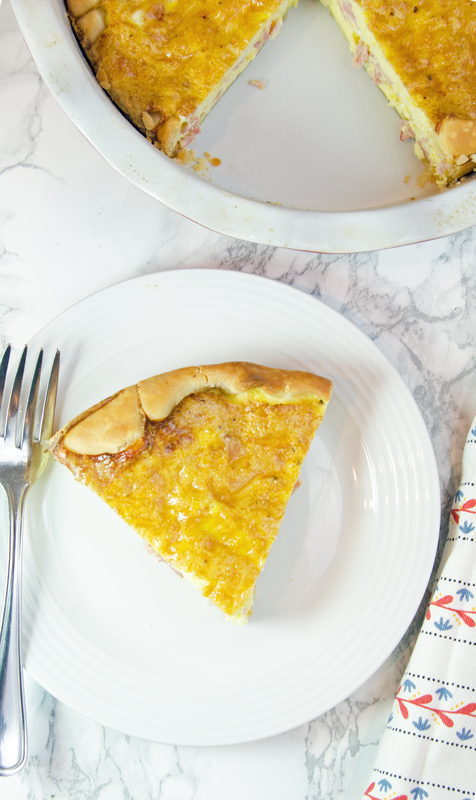 It is a great basic quiche recipe to keep in your arsenal of bunch day recipes. It can be whipped up in less than 5 minutes and served at pretty much any temperature. If you don’t have swiss cheese you can use any hard shredded cheese you have in your refrigerator. This recipe also reheats well for breakfast or lunch leftovers. By using half and half, I’ve cut several calories from the quiche. If you want to save a few more, you can use a reduced fat pie crust and light swiss cheese. You can also cut 2 of the eggs and replace them with 4 egg whites. Though at less than 300 calories a slice, I say indulge! Easy Ham and Swiss Cheese Quiche is a basic, yet tasty quiche recipe perfect for brunch with only five ingredients and 5 minutes of prep work. In a pie plate, place pie crust. In a bowl beat eggs. Add cream to eggs and mix together. Add ham, cheese, salt, and pepper to the eggs and cream, mix thoroughly. Pour ingredients into pie crust. Bake for 40-45 minutes on center rack. Pair this quiche with a simple salad and you have one awesome lunch or bunch. Be sure to save this recipe to your favorite Pinterest board for later. 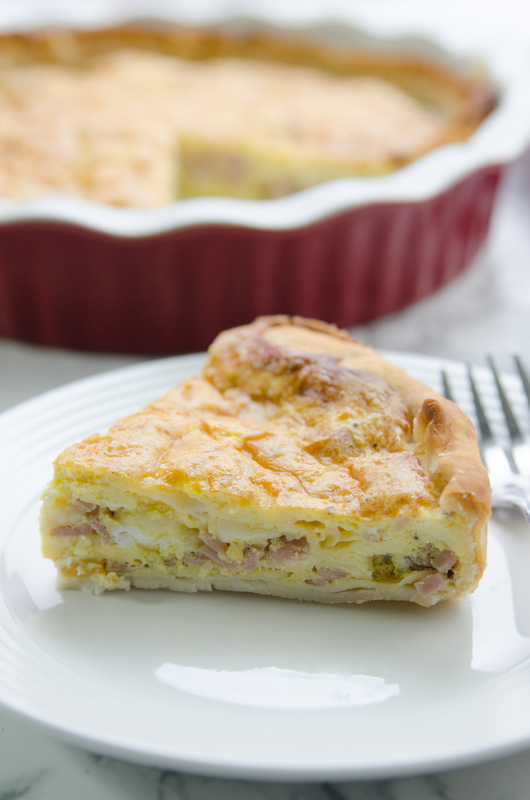 This post, Easy Ham and Swiss Cheese Quiche, was originally posted on January 7, 2013. It was updated in March of 2018 for accuracy. How many servings for that NI? serving is 1/8 of the pie. I made quiche for dinner tonight – thanks for the inspiration! Awesome Susan. I hope you enjoyed it.